How Do You Recycle….You Know…That Stuff? I’m going to use a dirty word. It’s a word that will stop all conversation in the room. People find it shocking…appalling. Use this word and others will question your sanity. In short, hilarity ensues. You are, quite literally, full of crap. It’s a fact. You produce it at intervals throughout the day. What do you do with it? Do you pollute drinking water to make it magically go away? Where does it go? Do you have a septic tank? How often do you have to get that pumped out? Where does it go from there? Do you live in town? Where does that go? Sewage treatment plant. In all, about 9.1 billion gallons of untreated sewage-contaminated water — enough to fill 457,000 backyard swimming pools — were released into the environment by 276 villages, cities, counties and sewage districts on 1,198 occurrences statewide since Jan. 1, 2006, according to data collected by the DNR and analyzed by The Post-Crescent. The wastewater overflows happened in 58 of the state’s 72 counties, including throughout the Fox Valley. Rain was listed as the cause of nearly 80 percent of the overflows since 2006. The article linked above lists some truly horrifying stats on sewage overflows. Nearer to home, I remember an event causing the sewage treatment plant in Jacksonville, IL to overflow, putting the city on a boil water order. Let me say that differently. Because of rain, everybody’s doody mixed with the drinking water. The solution was to boil the doody-water so it would be safe to drink. Tell you what. You can boil your doody-water all you want. I’ll make you a promise. It won’t be my doody in the water. OK? I have a better solution all of us can embrace. Ready? Compost. I found Joseph Jenkins’ Lovable Loo some time ago. We needed a solution for the barn as we were potty-training our daughter. Plus our septic tank had failed and we were pretty desperate for an inexpensive solution. Enter the eco-potty. Jenkins’ excellent book describes a method of collecting our various biological deposits (wastes is the wrong word) in a bucket. Everything goes in the bucket. Everything. Each deposit is covered with sawdust. There is no smell. Let me repeat that. There is no smell. We go through a bucket for each person in the house each week and use nearly a bucket of sawdust for each bucket we fill. This is not a composting toilet, just a receptacle. We compost our wastes on site. Nobody hauls, pumps, aerates, filters or chops our waste. It doesn’t have a chance to pollute fresh water. More importantly, no Persians were shot to make the transportation of my doody cheaper. We just carry the bucket to this year’s compost pile, open the pile and dump the bucket. It really is just a bucket of wet sawdust when we dump it out. Then we rinse (using rainwater when it rains (remember rain? )), wash with a biodegradable soap and rinse again. The clean buckets sit in the full, sterilizing sun until we’re ready for them again. B. that’s too much like work. We just open the top, pour new stuff in and cover it all up again. Then the pile sits unattended, unloved and untouched for another year. By that time the material has cooked itself thoroughly, cooled and has been sifted, sorted and sterilized by earthworms. Any bits of plastic or whatever are sterile and can be sifted out easily. We also compost roadkill animals, chicken offal, pig heads and whatever else we can come up with but I’ll cover that in a separate blog post. Jenkens uses his humanure compost on his garden after 2 years. I have enough other sources for compost and enough need for compost other places that I choose not to. It is uncomfortable enough asking guests to use a bucket. It’s more uncomfortable to say, “Hey, remember when you were here 2 years ago and used the bucket? I used that to grow tonight’s dinner!” Nah. Our pastures will benefit from the compost and we’ll use the composted winter animal manures on the garden…mostly chicken manure. Somehow that’s less icky from a guest’s perspective. Now, the EPA disagrees and says it’s no big deal. It is unusual for me to quote a government alphabet soup agency in a positive way but let me state clearly that I am in favor of using biosolids in agriculture. That’s kind of the point. I think the municipal collection is wasteful, inefficient and unsustainable but since we have it let’s put it to good use. But far better is to gather your own waste and deal with it yourself. That may not be easy for appartment dwellers but I’m sure we can find a workable solution. In a normal world, companies would pay you to collect and process your biological wastes…but we don’t live in a normal world (IMHO, largely due to alphabet soup agencies). All that said, I promise you, when you’re at my house eating food from my garden you aren’t eating people doody. Just composted chicken, cow, pig, goat, worm, duck, toad, snake, mouse doody mixed with a dead baby bird or two that fell out of a nest in a windstorm. “OK. Fine.” you say. “I’m willing to try it if you can prove to me it really saves any water. I mean, I have a low-flow eco toilet that I sometimes have to flush twice if I want to “deliver the mail”…but it says it’s eco!” Did your water bill go down by 30% when you started using your double-flush low-flow toilet? Our water bill went down by 30% immediately. It deserves more excitement than that. We have saved at least $500 on water since we began using the toilet 14 months ago. I think that’s pretty cool. On top of that, I have an enormous pile of…compost I can spread on my fields. This post is more “how-we” than “how-to”. In fact, it really just introduces the concept. For the real how-to I have to suggest Jenkins’ book and his series of Youtube videos. Outside of those two resources, let me know if you need more detail or if you have any questions. The best thing you can do is just get a couple of buckets and take it for a test drive. This entry was posted in Composting and tagged Humanure, Humanure Composting. Bookmark the permalink. excellent post, haven’t gotten to building a compost toilet yet, but will. any advice on building one? did you follow his lovable loo design? I followed the plan from his site to build our original. I’m working on building a new one modeled after the one he ships currently. My sister asked me to build one so I’m going to go ahead and build two. I have seen a number of variations in toilet design. Some build a box that looks like a normal toilet with sawdust in the “tank” on the back. Whatever you do, get a quality bucket with a good, sealed lid. The bucket will make or break your adventure. Awesome post – I just got a copy of the book from the library this week, started reading yesterday. Your “how – we” perspective is valuable, because “how-to” books often leave out the real life component of doing things like this with – kids, visitors etc. So what do you do about visitors? Do they only come once after their first sawdust chucking experience? How well do the kids cope? When we were in Greece last year, we found out they don’t put toilet paper in the toilet, there is a small lidded garbage can for that beside the toilet – my husband was appalled. Presumaby TP is ok in this system, since it would compost. And your point about low/dual flush toilets is well taken, we’ve definitely had experience with poor flush with another model, but I have to say the Caroma brand really lives up to it’s claims – I don’t even know where the plunger is, we use it so seldom. One of the reasons I’m interested in the humanure thing is precisely because of sewage treatment here. We have a septic system, but it’s a small tank (300 gallons), and while we try to conserve water, 2 teen girls is a powerful force to reckon with. We have a grey water system (this is a grandfathered thing – definitely not up to current code locally) for the kitchen/laundry, but all the bathroom water goes to the septic. Treated sewage here goes – into the ocean. I know. That’s why I’m interested in this. We have an undersized septic tank for a family of 6. In fact, it’s not even a real septic tank. And it’s under the house but that’s a story for another time. Suffice it to say, when all 6 of us use the septic, the house stinks. When we made the transition it was just that…a transition. We gave the kids the option. The younger kids were eager to try out the wooden potty. The older kids were about 50/50. No pressure. We really work to avoid forcing our kids to do anything…let alone potty in a bucket. In a short time they all voluntarily started using the wooden potty and the house smells MUCH better. Guests are a different issue. We really try not to make the first move. There’s a normal potty and there’s a wooden box with some instructions hanging nearby. Most people don’t ask. Most people don’t want to know. We feel the house is more welcoming if they have the option. Our guests don’t put enough pressure on the septic to cause any lasting odor issues but we do light a candle when we have company. I have my doubts that there will be a flushing toilet when we build a house but I think the transition period with the kids was a good thing. We did have an awkward peer experience with some friend’s children. They thought the whole thing was really weird. It is kind of weird. But it works. I suspect your teen girls will have reservations but if they come around they will be able to present a convincing “Save the Earth” argument to their teen friends. Or they’ll be weird. Either way, no big whoop. Yes. Everything goes in the potty. Feminine hygiene and all. The wife is sure to buy products that rot and works to minimize the plastic. We try to put plastic in the trash can. No real change from a septic system there. Everything goes in the potty. Kitchen scraps that have to be composted? Potty. Floor sweepings? Potty. Paper towels from cleaning a dog mess? Potty. Thanks. Lots to mull over. It’s weird that we as a culture have developed such an aversion to the composting toilet idea when we’re really not that far removed from outhouses, at least here in North America. Which may be my angle, since we’re keen campers and pretty used to outhouses. Well, howdy doody! I’m truly tripping! I had no idea this type of option existed and I find it fascinating. But having to use outhouses as a kid when visiting relatives in the country scarred me. I support you guys and your ingenuity, but I don’t think this would be for us. I have used outhouses. 2-holers even. This is nothing like an outhouse. But, it’s probably not for everybody. Thanks for the thorough explanation. It’s not something we’ll use in our current situation but who knows what the future will hold. I think it’s interesting that you commented that you all try not to force your kids to do anything. I feel like I have to force mine to do everything. Are you all unschooling? We started toward unschooling then found The Thomas Jefferson Education. We seek to inspire rather than require. My father made a suggestion on this topic. Now, I have to warn you, this is not rated PG. There’s some language. Also, if you’re at work (and a lot of you read this at work), be careful not to laugh out loud. Dad suggested you check out the “Red State Update On ClimateGate” for their opinion on humanure. Again, this is pretty funny but not entirely PG. I/we did this for about a year. It was more work (one more thing to do), but it made me feel good to do it, especially considering our very old septic tank. My biggest issue was limited buy-in from the rest of the family. Despite a lot of encouragement (trying to stop short of nagging), the only time other members of the family would use the bucket was if the flush toiled was occupied. I want to try it again — now that the kids are older, maybe we’ll have better luck. And yes, Jenkins’ book is fantastic. It’s also the best book on composting I’ve ever read, and very funny in places. Everyone should own a copy (Humanure Handbook vol 3). It is an extra chore but it’s an infrequent chore. I say go for it. Lead the way. Your kids may or may not come around but lead by example. Even if they don’t buy in, you will positively impact your water bill, your soil fertility and your ecology. Our oldest daughter hates change. She cries when we cut the dog’s hair. She came around to the wooden potty. It may have helped that we put the wooden potty in the bathroom near the flushing toilet. Comfort zone or something. My husband and I live in a 264 sq. ft. cabin for a year and a half and we’ve been using a composting toilet the entire time. Years ago I wanted one of the Sunmar or Biolet jobs, but never had enough money at one time, so when I read the Humanure Handbook I felt the least we could do is purchase a $3 bucket and give it a shot. I’ve since upgraded to a urine diverter insert because we pee ALOT. In fact, that’s the majority of our waste, and we still have to empty a 4 gallon bucket of liquid waste a week. I’ve not dug into the first year’s pile, but i know the volunteer tomatoes love it. It only takes about 10-15 minutes per week to clean everything up and it’s not an onerous chore either. My biggest concern was cover material. The first year we used coconut peat, since that’s what the cats used. The obvious expense of purchasing the bricks as well as the hidden expense of transportation had me reconsidering the materials I could access. Enter the chipper/shredder and local bales of straw. 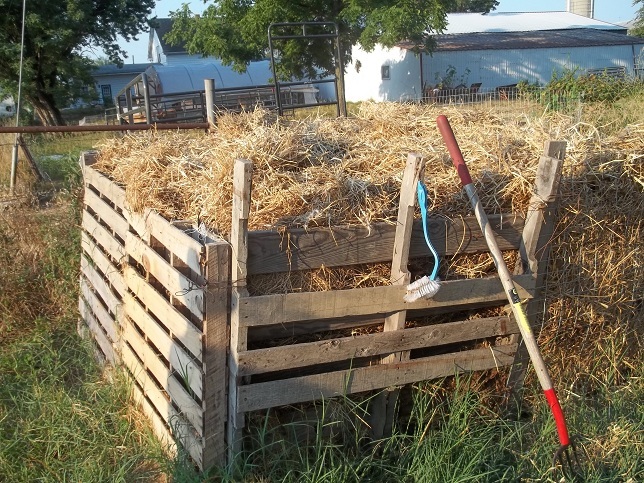 A $6 bale of straw lasts us (and the cats, since that’s now their litter) about 3-4 months. We simply shred it and store it in a 55 gallon trashcan, filling up our inside bin as needed. Honestly, I wish I’d done this years ago. Thank you for posting that. It’s really helpful to learn how others solve the covering material problem. I bet you do have trouble absorbing urine in straw. Sawdust soaks it up quickly and where I am I can buy 4 tons of fine, fresh sawdust locally basically for the cost of the hauling. What interests me most about your reply is the 264 sq. ft. -ness of it. I need to know more. That’s a little smaller than the room I am sitting in. And I don’t have cats. Well, there are those days when looking at each other across such a small space can lead to a decided peak in stress, but for the most part I enjoy it. We use our front porch as an extended living area when its warmer. I have an outdoor grill I use for cooking, and a small indoor gas stove for the winter. The nifty thing is that I can clean the entire place from top to bottom in around 2 hours, which gives us more time to play with the 2 cats (who come and go through a cat door) and the dog who won’t come into the cabin unless its really cold outside, as well as maintain the yard/plant trees. I’ll readily admit that I have a tendency towards collecting ‘stuff’ and clutter, but a small home doesn’t allow for such things. The main things we’ve learned are: 1) its easier to heat/cool, 2) unless it’s absolutely necessary or can be multi-purpose DON’T drag it into the cabin, there’s no place to put it, and 3) our families don’t understand why we live that way and are tired of asking us to consider a 30 yr mortgage. Our composting toilet is just one facet of trying to live simpler with fewer bills, and cutting down on our water use. To push it just a bit further, I have cut down on how much TP I use by implementing ‘pee towels’. We still have it available for guests, so I’m not forcing additional disagreeableness on them. In short, its been easier to adapt that I would have figured. Thank you for the additional detail. 6 people in this house. We haven’t considered a floor plan under 800 sq. ft. but even then, where would I put all my stuff? You know…those books I’m going to read again in the next decade or so? That second copy of Scrabble? You have gone further than I am willing to at this point. I’m not saying never, I’m just not there yet. Hats off to you. That sounds so right — congratulations to you. Our house is about 1200 sq ft for 2 adults, 2 children, 5 cats, and one small dog. The chickens have to stay outside. A bigger house always sounds good to us, but all it would do is enable additional accumulation of stuff, which is not the direction I want us to go. The heating/cooling of a larger house is the biggest issue in my mind. If you have a 3500 sq ft house, most of the time you’re going to be heating/cooling all of it, while the occupants can only be in one room at a time. What a waste! If we lost heat in the winter, we could close off all but 500 sq ft quite easily, which the woodstove could really warm up. I never knew about using sawdust with this form of recycling and it makes sense that sawdust would work here just as it does with livestock. I thought about putting in a traditional or chem outhouse down by my outdoor sand riding arena so like this option instead of either of those. Would be a good way to try it too. In this scenario it would likely only be used a few times a wk if that. How frequently do you need to empty the bucket? Do you need to empty it wkly regardless of volume or would monthly or something work? I would worry that the bucket would collapse under the weight of some guests. Buckets are only so strong. With the loveable loo the box supports the weight. Prevents it from tipping as well. Smells are not a problem. You only smell the sawdust and some sawdust smells great. We especially liked the sawdust from a honey locust tree I sawed a few years back. With 6 in our house we go through about 7 buckets/week. I would think you should empty it frequently enough that it doesn’t dry out. Also, ours went through a proof of concept at the horse barn. Didn’t take long and we brought it in the house. It almost seems like acceptance of this is all about Location, Location, Location! At the Horse Barn – great item, better than squatting out back. That Cabello’s version on a hunting trip in the wild – great there too for the same reason. In the house – wait a minute that is not the standard we are used to in this day and age! I wonder if all the people who gave it 5 stars on the Cabello’s page would rate the upscaled indoor version the same? 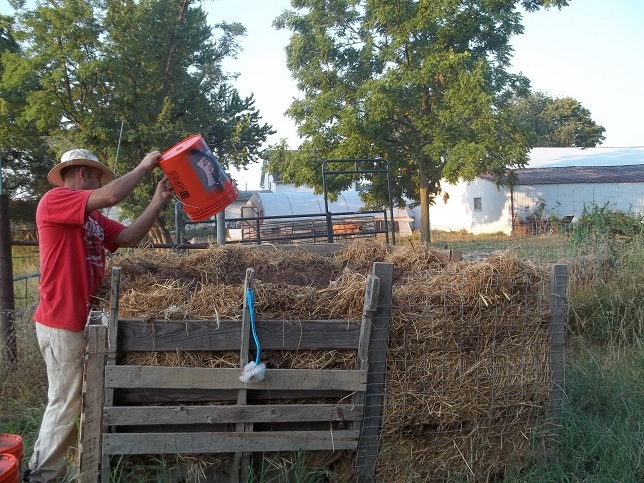 Ditto on location with the finished compost – no one wants to think of that on their veggie garden – out on the hay field maybe. I rented an acreage one time about 5 miles from the City Lagoons and my ex knew a guy who’s company plowed roads (snow) in the winter and in the summer hauled humanure from the City facility to spread on farmer’s fields. In this City of 250,000 everyone flushes the toilet but never thinks about what happens next. On your farm you are just “taking care of business” without a bunch of city engineers on your payroll and high priced machine operators for dealing with the ewww factor. I think they paid the farmers for taking this compost because of the ewww factor but can’t recall for sure. I have been thinking about putting a bthrm in my partially finished bsmt to enjoy the free air conditioning mother nature provides in the hot summers and this may be it’s introduction into the house. I have infloor radiant heat in my house in the winter so take note of your comment to not let it dry out. I could build a loo frame so the bucket sits off the floor with 2” of hard styro insulation and dodges the in place drain stub. My parents recently got a new low flush toliet and it is 2″ taller than a standard and that is called a comfort height toliet making sitting down and standing up easier. I like to recycle and reuse everything and love old barn board and got a stack that came with my farm so planned to use that as wainscoting paneling in that bsmt bthrm and could make a matching recycled barn board loo – could be a show stopper as a recycled barn board, comfort height, lovable loo composting toliet – I will have to call Better Homes and Gardens to come do an article – lol!